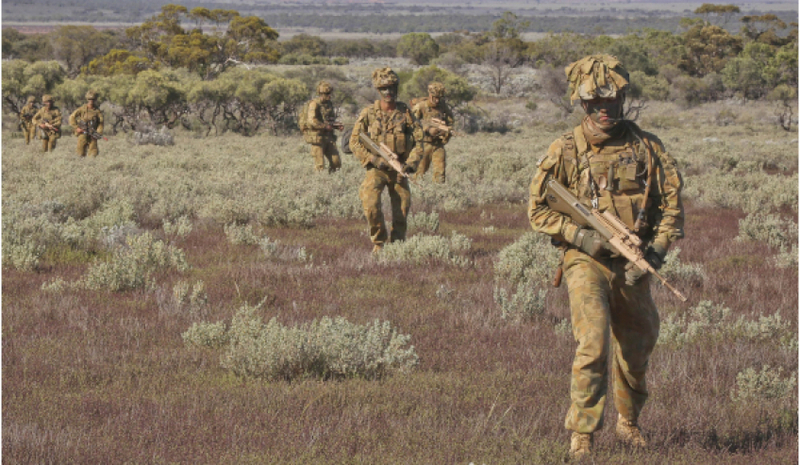 Army is building on the success of Plan Beersheba, integrating doctrine, technology and personnel as part of Accelerated Warfare, to develop a lethal, hardened and networked force capable of dominating the battlefields of the future, while supporting the broader 'Joint Force' ADF. Modern warfare has rapidly evolved over the last three decades, from high-tempo, manoeuvre-based operations that leveraged the combined capabilities of air, sea, land and space forces to direct troops, equipment and firepower around the battlefield during the first Gulf War, to low intensity, humanitarian and peacekeeping operations in southern Europe and the south Pacific, and the eventual rise of asymmetrical, guerilla conflicts in the mountains of Afghanistan and streets of Iraq. This evolution has forced a major strategic rethink in militaries around the world, particularly as peer and near-peer competitors continue to invest in key technologies and combined arms capabilities, leveraging off the lessons learned over the preceding decades. Australia is no different. The introduction of Plan Beersheba in 2011, and the shift toward developing a truly 'combined arms' force capable of leveraging Australia's traditional advantages in high-tech platforms, world-class infantry and 'espirit de corps', serves as the nation's first attempt to modernise and recapitalise the Army to face the fluid tactical and strategic challenges of the 21st century battlefield. A key component of Beersheba is the development of specialist Australian amphibious elements, combining infantry, armour, air and artillery assets to enhance the combat effectiveness, deployability and surviveability of Australia's army, particularly as the centre of gravity for global power re-orientates to our region and its unique operating environments. Supporting this major recapitalisation and strategic reorientation is the major redevelopment programs across both Navy and Air Force, particularly the introduction of the Canberra and Choules Class amphibious warfare ships, which have supported the development of Australian amphibious elements. The shifting focus towards specialist amphibious warfare capabilities, combined with the structural reorganisation of the Army to focus on integrating infantry, armour, artillery, combat signals, engineers and support elements across Army's three regular force combatant – 1st, 3rd and 7th Brigades – served as the fundamental basis for refocusing the structure and combat capabilities of the Army between 2011 and 2017. In finalising the structure and development of the Army under Plan Beersheba in late 2017, than Chief of Army, now Chief of Defence, General Angus Campbell, AO, DSC established the groundwork for what would be the basis of his successors shifting focus for the Army, saying, "The changes delivered through this plan have established the foundations to ensure that as the Army moves forward we will continue to be a modern, connected and technologically advanced force." Reinforcing this, Major General Gus McLachlan, Commander Forces Command, told Defence Connect, "In Plan Beersheba we have the spine, the backbone of our 21st century, combined arms force, but it isn't the future. That is where Accelerated Warfare comes into play, it aims to make Army an adaptable and capable force." Internal command structure shake-ups within the ADF, particularly the appointment of GEN Campbell to Chief of Defence and the appointment of Lieutenant General Rick Burr, AO, DSC, MVO to Chief of Army, have enabled the transition of the Army from the foundations established under Plan Beersheba to the next-generation doctrines of Accelerated Warfare and Army in Motion. Geopolitics: The Indo-Pacific regional order is defined by a rapidly changing threat environment and operating spectrum of co-operation, competition and conflict. The days of unchallenged coalition operations are quickly fading as state and asymmetric actors all develop capabilities that threaten the natural advantages Australia and its allies have leveraged for supremacy over the past 50 years. Threat: Indo-Pacific Asia's operating landscape is changing. Adversaries, including violent extremist organisations and state-based threats can now control and influence all operating domains. Future strike capabilities will not just be physical but also digital, executed often at the speed of a mouse-click. Sophisticated anti-access, area denial (A2/AD) capabilities offer the ability to deny manoeuvre while distributed systems that are ‘smarter’ and smaller are becoming increasingly essential to survivability. Networking will be critical in terms of generating a system capable of ‘co-operative engagement’. Technology: As in civilian life, technology is changing the way war is fought. The rapid development turn around of technologies like UAS, the proliferation of non-traditional intelligence gathering devices, the convergence of big data, artificial intelligence, machine learning, robotics and precision strike capabilities all present significant challenges, not only to operations, but to the decision-making process of soldiers and commanders. Domains: The reach of sensor and precision fire means Army must be across all domains and comprehensively integrate across them. Space and cyber have not been fully contested in previous wars and there is limited knowledge on how conflict in these domains will play out in the future. Army's ability to operate in the traditional air, sea and land domains are at risk of being debilitated from space and cyber, yet there is also great opportunity in these domains for military advantage. Responding to these unique challenges has served to establish Accelerated Warfare not only as the successor to Plan Beersheba, but the next stage in the evolution of the Australian Army as a fully-fledged, combined arms fighting force capable of fighting and winning in every key domain of the 21st century battlefield. A core component of this future focus is the introduction of key platforms and technologies to ensure that Army remains ahead of potential adversaries, while also being capable of leveraging the intelligence, surveillance and reconnaissance and strike capabilities of key Navy and Air Force platforms, like the Air Warfare Destroyers, Canberra Class amphibious warfare ships, the E-7A Wedgetails and the F-35A. MAJGEN McLachlan expanded on the multi-domain co-operation between key platforms, saying, "It is Army's response to the ADF's journey to develop an internet of things (IoT) approach to data gathering nodes across the services, like Navy's AWDs and Air Force's F-35s, and then Army being able to provide a shooting solution, should it be required." Like both Navy and Air Force, Army is undergoing a major recapitalisation and modernisation of its key force multipliers and platforms, not only to replace ageing equipment but to ensure that Army is capable of serving as an equal partner within the 'Joint Force' ADF and is capable of meeting the operational, tactical and strategic requirements placed upon the service. Reinforcing this, in his speech upon assuming the role of Chief of Army, LTGEN Burr said, "Army has a vital role to play as part of the joint force, to assure our warfighting capability into the future, and to offer the broadest utility by leveraging our unique strengths, to operate across all domains and across the continuum. We will harness the whole Army, enable and leverage the potential of the joint force and the entire enterprise." For Army, key projects like LAND 400 Phase 2 and Phase 3, LAND 19 7B, the future surface-to-surface long-range strike missile and integrated air defence platforms provide the service with the ability to leverage key inter-service platforms like AWD and F-35 to develop a robust shooting solution and a unique A2/AD network in response to the rapidly evolving technological and geopolitical realities of the region. Major platforms like the Army's Boxer Combat Reconnaissance Vehicles (CRV) as part of the $5.2 billion LAND 400 Phase 2 program, the yet to be announced LAND 400 Phase 3 next-generation Armoured Fighting Vehicles (AFV), combined with the introduction of the Hawkei Protected Mobility Vehicles, form the basis of a fast, networked and hardened army, while planned upgrades and a possible expansion of Australia's fleet of M1A1 Abrams Main Battle Tanks (MBT) as part of LAND 907 Phase 2 seeks to expand and enhance the combat power of the nation's armoured corps. Additionally, following teething problems, the growing capability of key air support platforms like the ARH-Tiger and MRH-90 Taipan are serving to enhance the overall capability of the Army and the broader mobility, manoeuvre and ability to conduct high intensity, high-tempo combat operations, without losing the ability to conduct low-intensity, asymmetric or humanitarian support operations. Army is also focusing on key disruptive technologies to ensure that traditional platforms, like armour, artillery and armoured fighting vehicles remain effective, integrated and future-proofed force multipliers essential to the broader success of both Accelerated Warfare and the 'Joint Force'. In particular, the growing use of unmanned aerial systems, from the individual soldier level, through to the platoon and command level are serving to enhance not only the intelligence, surveillance and reconnaissance capabilities of the Army, but also enhance the decision-making process for commanders in the increasingly congested battlespace. "The Army UAS program is a key example of how Army and industry collaborated to deliver a leading-edge product to the service in short order," MAJGEN McLachlan explained. Further to this, MAJGEN McLachlan expanded on the role innovation, technology and open systems architecture will play in supporting Accelerated Warfare, saying, "Major General Kath Toohey, Head of Land Capability, took over from me in modernisation. She's one of the leading experts in the world around common vehicle architecture, and she's driving good information going out to industry. "We'll see it [open systems architecture] on Hawkei for the first time where we'll almost be able to plug-and-play within reason around those capabilities. So bring us systems that talk to each other that can share data, low latency, high levels of accuracy, and let us build this internet of things, our deployed control network that actually talks to each other rather than hits proprietary boundaries," he said. Further expanding on this, Army's shift toward non-traditional capabilities, particularly the A2/AD role as part of supporting the 'Joint Force' doctrine, while ensuring that agility, lethality, human potential and integration remain core components of the 'Army in Motion', ensuring that the Army remains ahead of potential adversaries across all domains. Both Accelerated Warfare and Army in Motion play critical roles in supporting the development of the ADF as an integrated, combined arms force, capable of complementing the unique capabilities of each branch, while leveraging the high-tech components, support and key mission and broader national security objectives. "So how do you then overlay F-35, Air Warfare Destroyer, LAND 19, 7 Bravo, ground-based air defence capability, and soon to come anti-ship missile and long-range surface fires? That's a really important opportunity. That has huge implications for Defence. We're always going to be small. We're always going to have a relatively small number of these high quality platforms. So the ability to network them and achieve a single system of sensors and shooters, potentially a ground force that's persistent and difficult to dig out, and deploying some of those sensors into marathon choke points [e.g. Malacca or Lombok Strait] and so on," MAJGEN McLachlan said, explaining the growing importance of the Army as a key component of the broader future force. Integrating the broader ADF, particularly where each of the forces is an operational and strategic 'equal' capable of leveraging technology, doctrine, tactics and the world-class training of Australian soldiers, sailors and airmen and women provides a potent defence capability for Australia's policy makers, particularly as the regional security environment continues to evolve and challenge the established power paradigm. The nation's alliances, particularly in our region, will be enhanced by the development of the 'Joint Force' as Australia develops and integrates world-leading technologies, doctrine and personnel capable of engaging with, and overcoming, a variety of contingencies across the air, land, sea, space and cyber domains as threats emerge. These unique capabilities, particularly across high-technology platforms, innovative doctrine and highly-capable and readily responsive personnel, serve as the basis for securing the nation's alliances and more broadly securing the nation and its geo-strategic and economic interests throughout the region. As an Army in Motion, Accelerated Warfare serves as the next step in the evolution of the Army, which seeks to leverage the possibilities of both technology and the human potential that makes up the fighting force, building on the tradition and history of Australia's Army as an innovative, unorthodox and world-class fighting force, renowned for punching above its weight.